Netanyahu has actual red lines and is working to enforce them. When it comes to Syria, Israel has a message and the government hopes a wider audience is listening. It was delivered in the form of two strikes inside Syria over the last week. By itself, an Israeli strike inside Syria is nothing extraordinary. The Israelis have long broadcasted their red lines in Syria and have acted to enforce them. In August, a former Israeli air force commander said that it had carried out dozens of airstrikes on weapons convoys destined for Hezbollah over the past five years. Nevertheless, despite the war on its doorstep, Jerusalem has largely stayed out of the fray. What makes this latest round unique is the timing, the target choice, and the pointed warning that preceded it. Late last month, Israeli Prime Minister Benjamin Netanyahu sent a warning to Syrian President Bashar al-Assad himself that Israel will depart from its overall policy of non-intervention in the six-year-old conflict if he "invites Iranian forces to establish themselves in Syria via an agreement of any kind." 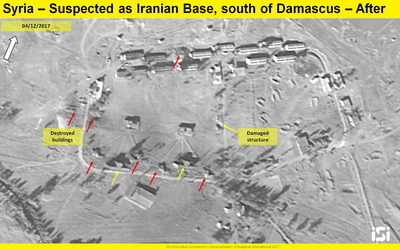 The warning came after a September BBC revelation that Iran was building a permanent military base in Al-Kiswah, eight miles south of Damascus and just 31 miles from the Israeli-held Golan Heights. Israel targeted the base over the weekend, reportedly killing 12 Iranian military personnel while destroying seven buildings and damaging three other facilities. The latter was confirmed by Israel's release Monday of their own satellite photos showing the results of their unconfirmed handiwork. Hours later, another strike was reported just northwest of Damascus targeting the Jamarya military facility and the Syrian Scientific Studies and Research Center, the government agency in charge of Assad's chemical and biological weapons programs. In August, Reuters revealed the existence of a confidential U.N. report claiming that two North Korean shipments bound for that government agency were intercepted. Israeli jets targeted the same site in January 2013 destroying a convoy of Russian-made SA-17 missiles being transferred to Hezbollah. While the message to Assad and Iran was unmistakable, Israel hopes Russian President Vladimir Putin will take note that its red lines on Iran are firm and will be enforced as he seeks to craft a postwar settlement. For President Trump, the message is a reminder that the defeat of ISIS doesn't mean the end of the Syrian problem and that substituting the Islamic Republic of Iran for the Islamic State is seen as an unacceptable solution in Jerusalem. Recent diplomatic developments have done little assuage Israel's concerns. After all, whether intended or not every time Trump and Putin meet, the Israeli prime minister ends up holding the short end of the stick. Such was the case in Hamburg, Germany, in July when after the U.S. and Russian premieres held their first face-to-face meeting on the sidelines of the G20 summit they announced a ceasefire and "de-escalation agreement" for southwestern Syria. It happened again on November 11 when after meeting on the margins of the APEC conference in Vietnam, Trump hailed the success of the agreement and reaffirmed its importance. 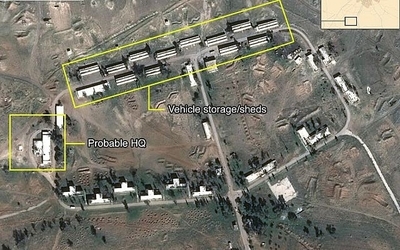 The problem, from Israel's perspective, is that rather than contributing to "a more sustainable peace," as the State Department claimed, the current de-escalation arrangement increases the likelihood that Israel will have to act militarily more frequently to prevent the permanent entrenchment of Iranian forces near its border on the Golan Heights. That process is already underway under the watchful eyes of Russian soldiers who now don the imaginary cloak of impartial ceasefire monitors. Certainly, words like ceasefire, de-escalation, and stability sound positive in the abstract but after Russia, Iran, and Turkey finalized similar ceasefire areas elsewhere in Syria in early May, their ulterior motives became clear. The de-escalation zones were designed to freeze the conflict along the western fronts in Idlib, Hama, and Homs to allow the Assad axis to redeploy its forces to the east. From Assad's perspective, the priority was to prevent the loss of territory in the oil-rich Deir ez-Zor province to the American-led Syrian Democratic Forces that were already making inroads nearby in Raqqa—the self-declared capital of ISIS. The needed redeployment was also viewed with urgency in Tehran as it represented the lynchpin of their quest to establish a land bridge along the Baghdad-Damascus-Beirut highway. From their perspectives, western Syria could wait. Apparently unaware of their shared motive, the U.S. spokesman for the Combined Joint Task Force – Operation Inherent Resolve, welcomed their participation at the time in the context of the Trump administration's hyper-focus on the defeat of ISIS. In Jerusalem, all of this was viewed as a slow-motion train wreck heading in their direction. Israel already must contend with Iran entrenched politically and militarily in Lebanon in the form of Hezbollah. America's current pro-Iran policy in Lebanon is of no help either, as I explained in THE WEEKLY STANDARD in August, and it remains uncorrected. As Levant specialist, Tony Badran of the Foundation for Defense of Democracies, recently put it more artfully: "This is not policy. This is poetry." Hezbollah continues to receive weapons shipments from Iran through Syria with increased frequency and improved lethality. They have deployed near the border with Israel where they built bases and storage depots within civilian areas, and constructed hardened positions along with a web of tunnels, reportedly augmented by the construction of underground missile manufacturing sites. Even worse, all of this activity is in clear violation of the United Nations resolution that ended the 2006 conflict between Hezbollah and Israel. The implementation of that resolution is monitored by a UN force of some 10,000 that would have trouble finding their own feet it they weren't attached to their legs. Their mandate was renewed by the UN Security Council at the end of August, a week after the head of the UN peacekeepers in Lebanon said that his force had no evidence that weapons are being illegally transferred to the country's south. That statement is akin to declaring no evidence of gambling can be found in Las Vegas. Israel is likewise under no illusion that a de-escalation zone in Syria monitored by Russia will be any more effective. Putting a finer point on the matter, Major General Mohammad Ali Jafari, commander of the Islamic Revolution Guards Corps (IRGC) recently elaborated on Iran's goal at a press conference in Tehran, in which he said "any new war will lead to the eradication of the Zionist regime." It's clear that Iran is seeking to recreate in southwest Syria the kind of launching pad structures Hezbollah enjoys in southern Lebanon. The current ceasefire deal is serving to accelerate that outcome. According to Israeli officials well-versed on the implications of the arrangements, Iran would be allowed to take up locations in some places just three miles from Israel. That is in addition to the new reality in which Hezbollah has already expanded and consolidated its positions on the Syrian side of the Qalamoun Mountains. Meanwhile, Shiite militias already active in Syria who take their orders from Iran's Islamic Revolutionary Guards Corps (IRGC)—Qods Force commander, Qassem Soleimani, have threatened to join in any fight Iran or its Syrian puppet wages against the Jewish State. As the leader of Iraq's Hezbollah al-Nujaba, Sheikh Akram al-Ka'abi recently told a Lebanese news network, "[w]e are fully prepared to participate in any war with the Syrian Arab Army to liberate the Golan if the Syrian state agrees or requests so." That organization reportedly controls some 10,000 fighters in Syria and has formed the Golan Liberation Brigade comprised of special forces with advanced weaponry in preparation for this task. It's no wonder, then, that Israel is alarmed by the latest agreements between the United States and Russia. Israel's Prime Minister Benjamin Netanyahu came out against the arrangement in July and a senior Israeli official told the Israeli daily, Haaretz, that the ceasefire "is very bad" as it "doesn't take almost any of Israel's security interests" into account. Likewise, in July, retired Brigadier General Yossi Kuperwasser, the former director general of Israel's Ministry of Strategic Affairs and head of the Research Division of IDF Military Intelligence, elaborated on Israel's reservations, which aside from creating a problem of proximity, included worries over the accelerated pace of Iranian deliveries of advanced weapons to Hezbollah; Iran's plans to build naval and air bases in Syria in addition to weapons factories; the effect of Iran's long-term and growing presence on pragmatic Sunni elements in Syria; and the capability afforded by such a presence that could allow Iran to exploit loopholes in the nuclear deal to perhaps even conduct nuclear-related research and development activities in Syria, beyond the monitoring means of the already hamstrung International Atomic Energy Agency in Iran. If one has a feeling of déjà vu with Iran continuing to make gains on the ground it is because this is a winter 2017 version of a rerun. After all, it was Barack Obama who conceded the Middle East to Iran in his quest to lessen America's regional footprint and seal a nuclear deal. Part of the inducement for Iran to negotiate included Obama's recognition that Syria would remain in their sphere of influence, which was confirmed in a secret letter Obama personally wrote to Iran's Supreme Leader Ayatollah Ali Khamenei in October 2014 and was reconfirmed at a December 2015 press conference where he referred to Iran's regional "equities." Sure, the Trump administration will say that Iranian forces will need to leave Syria as the war winds down but Russian Foreign Minister Sergey Lavrov recently explained that the terms of the ceasefire did not include a Russian commitment to ensure Iran-linked militias would be pulled out of the country, whom he explained maintained a "legitimate" presence in Syria. The recent Israeli strikes bring into stark relief the different priorities among the constellation of actors involved in Syria. Russia is currently in the driver's seat and it is unclear to what extent it will tolerate either Israeli attacks nearby or its Iranian partners creating undesired mischief. In the meantime, while President Trump may not have engineered America's existing pro-Iran policy in Syria, the effect of some recent decisions by the administration are serving to cement Iran and Russia's primacy in the war-torn country. The likely result will be hastening the arrival of the next war for the Middle East, only this time it could very well envelope most regional states, not just their proxies. All the while Iran will be closer to running out the proverbial clock on the nuclear deal, which would likely compel the U.S. to get involved on the ground in short order. If that happens, it will be in circumstances where Iran's power and regional entrenchment will have been greatly enhanced because of a course correction left unexplored in Washington during the 2017 reruns. Unless the dynamic changes, one can expect similar Israeli messages to be hurled into Syria.